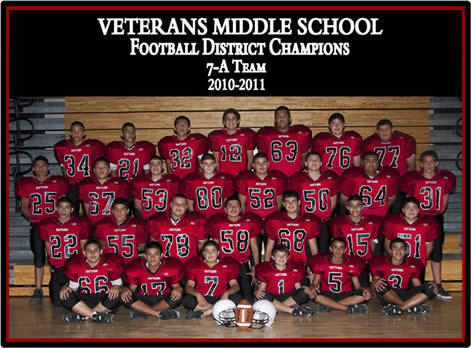 VETERANS MIDDLE SCHOOL – Congratulations to the VMS 7th Grade “A” Football Team for earning the Football District Championship title for the 2010-2011 school year! Football players on the championship team included (Bottom Row L-R) Victor Pedraza, Robert Briceno, Jorge Guajardo, Iram Galvan, Celestino Molina, Dante Silva (Second Row L-R) Christian Elizondo, Usvaldo Guerra, Arturo Ozuna, Milton Gonzalez, Jose Islas, Ivan Garcia, Noah Barba (Third Row L-R) Daniel Pena, Jerry Eligio, Luis Guerra, Luis Garcia, Bobby Reyes, Carlo Montalvo, Leonel Garcia, Mauro Sandoval (Top Row L-R) Juan Toscano, Gerardo Garcia, Juan Saenz, Daniel Garza, Joel Reyes, Martin Reyes, and Roger Benavidez. Coaches for this championship team were Omar Garcia, Frankie Mireles, David Pratt, and Jesus Garcia. VMS would like to thank the parents, community, coaches, and students for all their dedication and support.